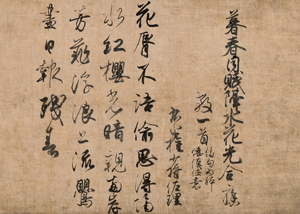 The history of Japanese calligraphy developed under the influence of Chinese calligraphy techniques. As Japanese styles of social systems and culture evolved in the mid-Heian period (around the 10th century), the renowned calligraphers Ono no Tofu, Fujiwara no Sari, and Fujiwara no Kozei appeared, who established the Japanese style of calligraphy. 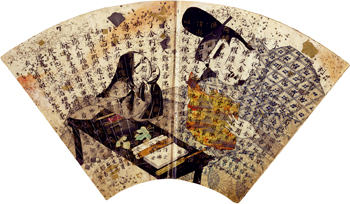 From then on, the tradition of Japanese-style calligraphy became central in the history of calligraphy in Japan. This exhibition introduces the allure of calligraphy by looking at its history, through an array of Japanese-style calligraphy masterpieces. * Advance tickets will be sale at the Museum ticket office (during museum hours, 30 minutes before closing hour), e-Ticket Pia (P-code:765-602), Lawson Ticket (L-code:31555), Seven Ticket (Seven code:021-948), E-Plus, JTB and other major ticketing agencies from Thursday, Maｒｃｈ 14, 2013 to Friday, July 12, 2013. Advance pair tickets (two admissions, 2000yen) will be sale at the Museum ticket office (during museum hours, 30 minutes before closing hour), e-Ticket Pia (P-code:765-603), Lawson Ticket (L-code:31555), Seven Ticket (Seven code:021-948), E-Plus, JTB from Thursday, Maｒｃｈ 14, 2013 to Friday, May 31, 2013. 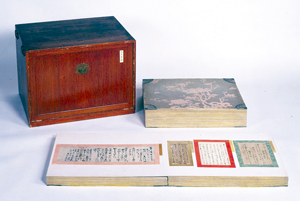 Organizer Tokyo National Museum, The Yomiuri Shimbun, NHK, NHK Promotions Inc.
Mido kanpaku ki is a diary written by Fujiwara no Michinaga (966–1027), who established the golden age ruled by regents and chancellors in the mid-Heian period. Matters of importance in regency government as well as the luxurious daily lives of the nobility are recorded in the diary. It is a first-class material which depicts the society and culture of those days. 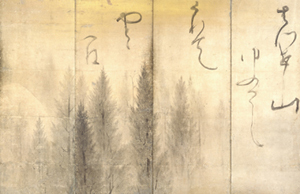 Michinaga is known to have built a close friendship with Fujiwara no Kozei, one of the three master calligraphers of the time, who excelled in Japanese-style calligraphy. 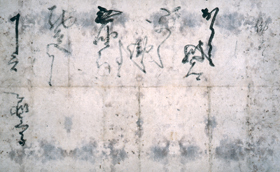 Kozei’s influence can be detected in Michinaga’s style of brushwork. Recognizing beauty in written characters, giving it form as calligraphy, and appreciating that calligraphy as artconstitutes a distinctive element of Japanese traditional culture. 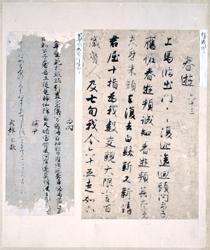 The kanji writing system was transmitted from the Chinese continent, then transformed by the Japanese in order to more accurately express their native language. 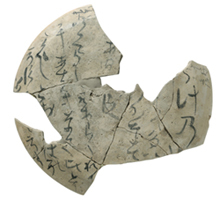 This led to the formation of the phonetic syllabary known as kana in the Heian period (794–1192). At the same time, even in rendering texts of Chinese kanji characters, a style of calligraphic expression characterized by gentle and more delicate lines was preferred. This softer form is what is known as wayo, or Japanese style. 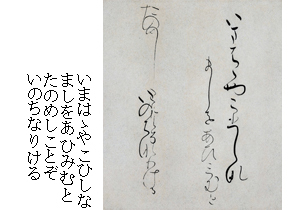 In the mid-Heian period, three exceptional calligraphers — Ono no Tofu (894–966), Fujiwara no Sari (944–998), and Fujiwara no Kozei (972–1027) — developed a delicate and elegant calligraphic style that grew out of a distinctly Japanese aesthetic sensibility. 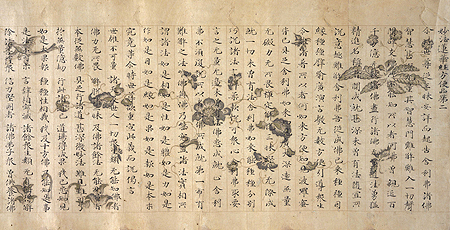 During this same time period, the Kokin waka shu imperial poetry anthology was compiled and an evolution of various kinds of kana characters accompanied the rise of waka culture. 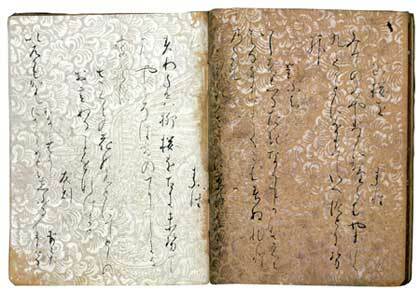 Since Japan did not have a writing system of its own in ancient times, the first kanji characters to arrive there were known as mana (“formal writing”) or otoko-de (“men’s hand”), while the simplified characters that abbreviated and transformed these mana characters into a cursive style were called karina (“provisional writing”). This word karina was elided to become kanna and eventually further shortened to become the word kana. 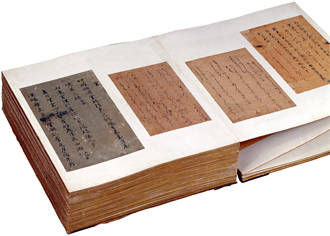 Since the time it was introduced to Japan, Buddhism was accompanied by the practice of transcribing sutra texts. 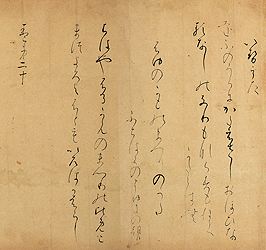 The somber calligraphic style of sutra copying at the Nara court was somber, which continued into the Heian period. However, from around the time when envoy missions to Tang China ceased, Japanese-style culture had begun to spread. 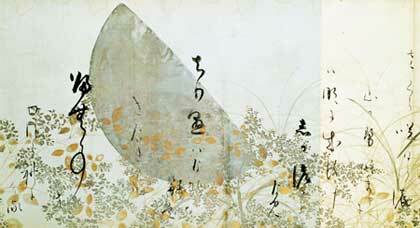 Calligraphic styles that had until that time which followed Chinese styles became moderated by a softness of touch. The utmost care is concentrated in every detail of the works, starting with the graceful Japanese-style calligraphy through to the details of the paper, the rollers, and even the wrapping braidscords. These magnificent sutra scrolls represent the height of ornamentation and thein ultimate sophistication of the culture of the time. 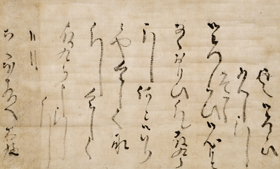 During the period from the tenth to the eleventh century, when Japanese-style calligraphy was becoming established, the kana syllabary also came into being. 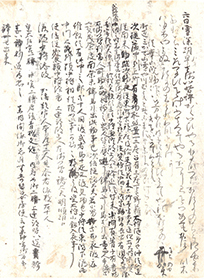 The fragmentary texts together known as the Koyagire exemplify the consummation of the kana form. 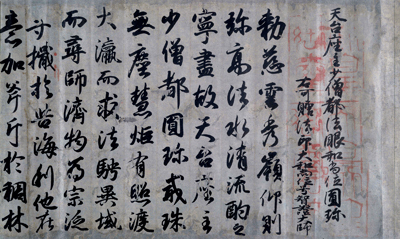 These calligraphic writings by people of ancient times are known as classic works of calligraphy (kohitsu), a term primarily used to refer to poetry anthologies from the Heian (794–1192) to the Kamakura period (1192–1333). 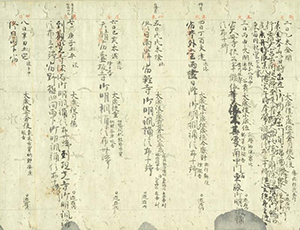 From the Koyagire onward, noted calligraphers transcribed poetic anthologies such as the Kokin waka shu and Wakan roei shu onto magnificently decorated writing papers. 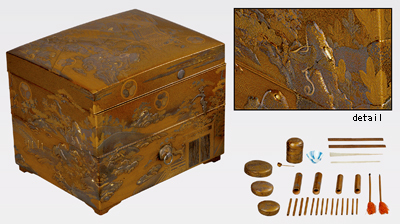 Among the noble families of the time, such works were considered precious gifts that were presented as “ornamental model books.” Later, with the popularity of tea ceremony and the practice of assembling collections into albums, many ancient writings were divided into fragmentary sections. Nevertheless ornamental model books that survived in their original form were passed down with great care. 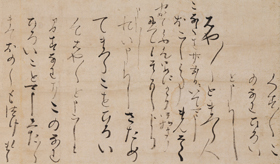 For a long time, the descendants of Fujiwara no Kozei served as official copyists at the imperial court and their calligraphic style later came to be known as the Sesonji School, a style that occupied an important position in the history of Japanese calligraphy. 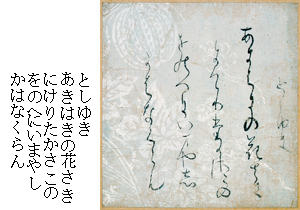 Emperor Fushimi (1265–1317), who was known as one of the great calligraphers of his time, demonstrated a mastery of Heian-period calligraphy in his fluid writing style, and his son, Prince Son'en (1298–1356), studied calligraphy from Sesonji Yukifusa and Yukitada, building on a mastery of older calligraphic styles to construct a unique style. His style had a great influence on later eras through the Shoren'in School and what would later become the Oie School. In the Muromachi period, many calligraphic schools lost their individuality and became stylized, and from this time forward, calligraphy spread as more of a practical writing form. 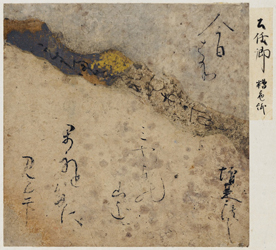 As the society became stable in the Edo period, Konoe Nobutada, Hon'ami Koetsu, and other artists developed a dynamic and personalized approach to calligraphy based on the kana of classical times. The liberal combination of text and image was achieved by the ambitious creativity of Nobutada's large-format kana, Koetsu's waka poetry scrolls, and other innovative works, defining a new realm of beauty.